"What's a company? What's a secret? What's a sports car? Are they more important than people?" In an ironic twist, when I began rifling through my morning paper the day after watching Black Test Car, the major story in the business section was a profile of an automotive spy, a positive look at a guy who makes a pretty good living stealing the automakers' secrets with his camera. This is a far cry from the world of Yasuzu Masumura's film, which uses automotive spying to posit the business world as an amoral snakepit of duplicity and win-at-all-costs viciousness. Masumura's film goes to extreme lengths to make its point that the spy in today's paper would likely (I hope) blanch at. Fantoma's new DVD of the film is an excellent presentation of a worthy picture. The Tiger car company is working on their latest model, a sports car known as the Pioneer. In the opening moments, the design team puts the car through its paces only to see it flip over and burn up in a ditch. Spies from the rival Yamato company are in the bushes, snapping away and supplying the press with photos of the crash. The head of the Pioneer team is Onoda (Hideo Takamatsu), whose every waking hour has been dedicated to building the new vehicle. But the leaks of information to Yamato lead him to build a special team, for the purpose of returning the favor and spying on Yamato. Their cause is made more difficult by Yamato's own chief spy, Mawatari (Ichiro Sugai), a former military intelligence man who is willing to use every dirty trick in the book to come out on top. Black Test Car isn't really the black comedy promised on the box; if it was intended to be a comedy, then it's a pretty poor one. As it stands, it takes itself quite seriously, looking at how the Pioneer team, especially Onoda and Asahina (Jiro Tamiya) slowly grow as twisted as Matawari in their pursuit of victory over Yamato. The final sequence, in which Onoda grills the company spy, is absolutely cold-blooded and ultimately unbalances the scales as to who we are rooting for. That's not to say that their actions haven't already pushed that line; Asahina's treatment of barmaid girlfriend Mariko (Junko Kano), using her as just another tool in the fight against Yamato, is reprehensible to say the least. The only problem with the film, at least to me, is the overall concept; these days, who doesn't think that corporations are hives of scumbag behavior? I doubt this was a new concept then, either, but Masumura couches his critique not just as one of business, but as one of Japan in general. The name "Yamato" is indicative of many things in Japanese culture, not the least being the name of a famous warship in World War II, the name of a folk hero, and of a period in Japanese history, to name just three. I don't think it's much of a stretch to take the naming of the rival company as symbolic of a larger entity. Masumura's inclusion of former military men in the equation adds another wrinkle, as its their influence that ignites the war between the companies and warns of a similar influence in other areas of society. All that aside, this film looks great, with many of the compositions putting us in a position of eavesdropping, which, while being normal for a filmgoer, has further attention called to it here. The acting comes across as ringing fairly true, with little scenery chewing, aside from a duplicitous newspaper editor whose very behavior raises red flags from the first moment he appears. What's perhaps most admirable about the acting s how the actors make what they're doing seem so natural and normal, because make no mistake about it, this is a dark, dark film. The most remarkable thing about it, from having just looked at Chuck Stephens' liner notes, is that the film spawned an entire series of such films, winding throughout Japanese industry for similar tales of morally bankrupt business battles. Having seen this, I can see why, and would love to see more. Image Transfer Review: The anamorphic transfer looks quite fine, with solid blacks and contrast. This is a great-looking film, and a disappointing transfer would have been a blow. Fortunately it delivers the goods without problem. The subtitles are clean and free of errors. Audio Transfer Review: The original mono is on hand, and like other films of its vintage, sounds a little tinny and harsh at times, but not to any truly deleterious extent. Extras Review: An insert essay by critic Chuck Stephens is the noteworthy item here. 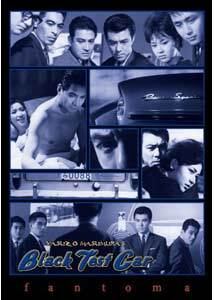 It covers the film in the context of Masumura's overall career and is definitely worth reading. On the disc, one can view the trailer (4:3 letterboxed) and view a stills gallery. A wickedly dark take on corporate behavior, Black Test Car doesn't bring the laughs as advertised, but it does pack a wallop, with beautiful cinematography and biting performances. No one needs to be told in the Enron age that corporations engage in grotesque behavior, but this is an entertaining way to hear it again.